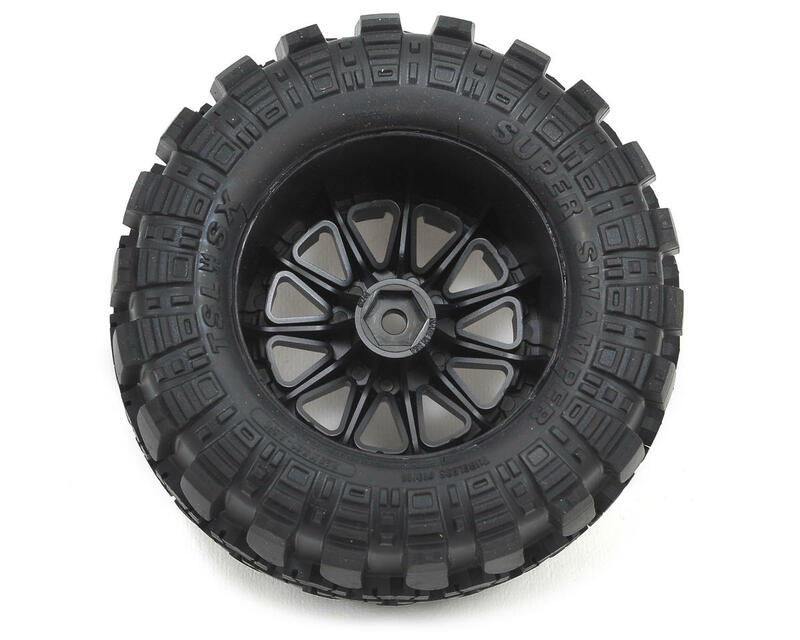 This is a set of two Pro-Line Interco TSL SX Super Swamper 2.8 30 Series tires, pre-mounted on Black F11 electric rear wheels. These pre-mounts are intended for use on the rear of the Traxxas electric Stampede and Rustler trucks. 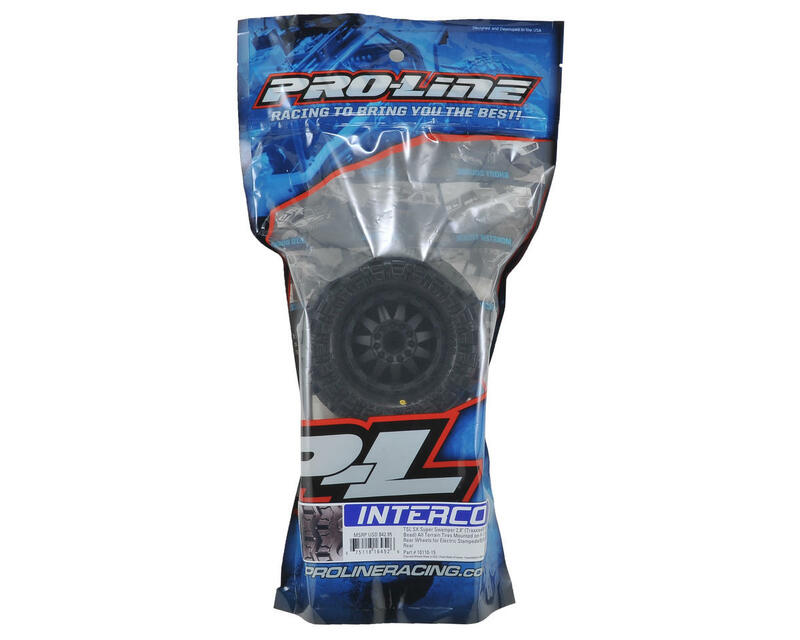 Under official license from Interco Tire Corporation, you need the Pro-Line 2.8” TSL SX Super Swamper. With “almost scale” not being acceptable and access to Interco’s design data, Pro-Line’s engineering staff has reproduced the Super Swamper in a scale configuration not previously available for 2.8” Monster Trucks. 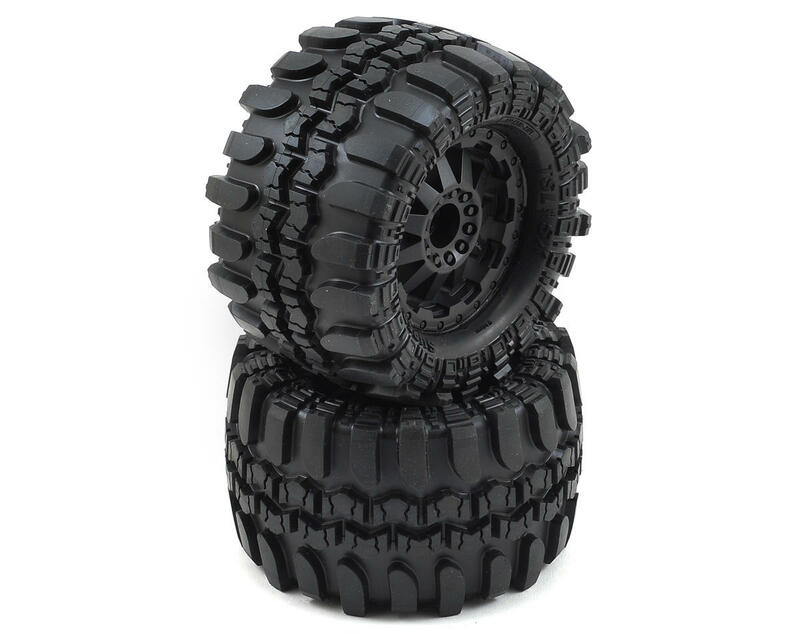 The 2.8” Super Swamper is perfect for drivers who want a licensed scale tire and unmatched performance in all terrain! Compared to the highly successful Trencher 2.8”, the TSL SX Super Swamper 2.8” has more side bite while maintaining similar forward traction with a more scale appearance. The Super Swampers also include 2.8” Closed Cell Foams that will outlast all other foams, are water-proof and help prevent against excessive tire expansion. The F-11 style wheel brings the tough and rugged look of full-size trucks straight to your vehicle of choice! The satin black finish of this super durable wheel will make your truck stand out from the rest. The wheel features a molded in bead-loc ring and lug nuts, 11 triangulated spokes and a scale P­L logo. This 12mm hex wheel is a must have for all Pro-Line fans! If you have a 2.8” Monster Truck and love scale tires and maximum performance, then the pre-mounted Interco TSL SX Super Swamper 2.8” tires are made for you!